Conservative PartyThe new passports will be issued to those renewing or applying for a passport from October 2019. Britain’s “iconic” blue passports after Brexit were supposed to symbolise Britain’s break from the EU and its new future as an independent trading powerhouse. It has now emerged that the passports will be made in France. “The new pro-Brexit blue passports were supposed to be a statement of intent and now we find out they are to be made by the French or the Dutch. The irony is unreal,” said Eloise Todd, from the pro-remain campaign group Best for Britain. EU rules mean the government isn’t allowed to discriminate in favour of British companies by excluding EU countries from bidding for new contracts. LONDON – Remember the “iconic” blue passports returning after Brexit, those powerful symbols that “Britain is back“? It looks like they will be made in France, due to strict EU rules on procurement. British firm De La Rue is set to lose its long-standing contract to produce the country’s passports, according to a Sun report. Instead, French firm Gemalto will be awarded the £490 million contract to produce new blue passports when they’re introduced next year. 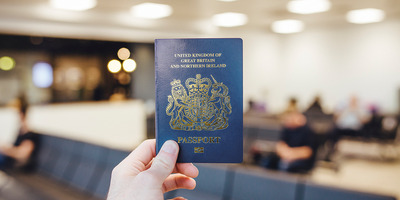 The Home Office announced in December that Britain would phase out burgundy passports, first issued in 1988, and return to the original dark blue colour. On Thursday, the boss of De La Rue – which first made British passports in 1915 – invited Theresa May and Home Secretary Amber Rudd to explain in person why that contract had gone overseas. The answer they could give is this: EU law means they have to. European treaty law, which the UK remains signed up to, includes the principles of non-discrimination, free movement of goods, and freedom to provide services. That means the government is not allowed to discriminate in favour of British companies by excluding EU countries from bidding for new contracts. The decision to award a £490 million contract to a French firm was the result of a “blind tender” process under which ministers were not allowed to see which company had submitted each bid. A German company also bid for the contract. Many have pointed out the irony of blue passports – intended to symbolise Britain’s break from the EU and its new future as an independent trading powerhouse – being produced in another European country. The news has caused fury among Brexiteers, including former Cabinet minister Priti Patel, who described it as “a disgraceful decision” and “perverse.” But the government was simply observing straightforward public procurement law. A spokesperson for Theresa May said: “We’re still in the process of running a fair and open competition to ensure the new contract delivers a high-quality product that offers the best value for money for the taxpayer. “The procurement process is still ongoing. Our passports are routinely redesigned every five years. The terms of that have been transparent.